The Caribbean faces numerous economic, social and environmental challenges, with current projections predicting the road ahead to be filled with low levels of growth, high debt and low resilience. 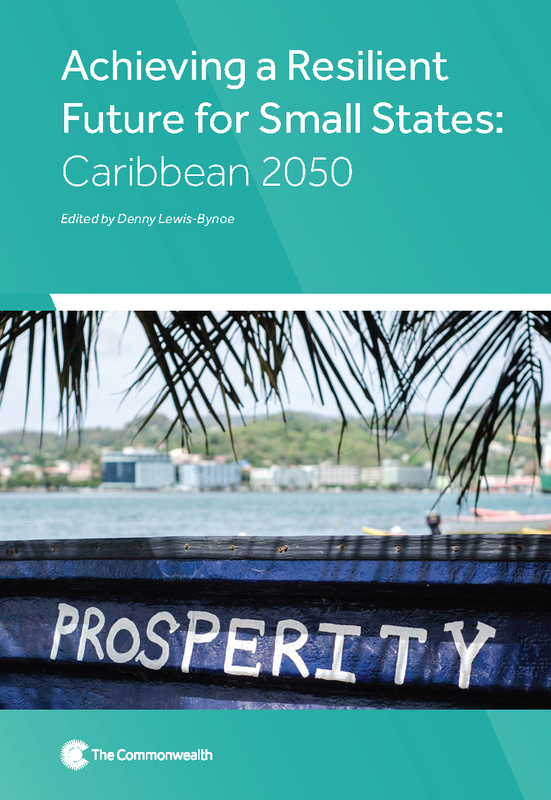 In Achieving a Resilient Future for Small States: Caribbean 2050, the contributors set out a long-term, research-based strategy for avoiding these projections, recommending a number of policy interventions aimed at building the region’s resilience and development prospects. Written by influential analysts and researchers and drawing on a wide cross-section of regional stakeholders and thought leaders, the study contains an assessment of the main challenges and opportunities for the region, scenario modelling of where the region could be by 2050, and a broad vision for the region with sector specific goals of how to get there. Denny Lewis-Bynoe, PhD, is the Head/Economic Adviser for Climate Finance and Small States, Economic Policy Division (EPD) at the Commonwealth Secretariat. An economist with more than 20 years’ experience, her research interests are in the area of development economics broadly and, more specifically, trade, labour markets, finance, growth and tourism in small states. Dr Marsha Atherley-Ikechi has more than 16 years of environmental engineering and utility regulation experience. She has worked within the civil service and statutory organisations, holding both senior management and technical staff positions. She has also guided a number of projects across a broad spectrum of environmental and energy issues. Dr Sylvia Charles is a consultant, with significant experience in economic development issues, in both government and academic environments. Her appointments include employment with the Government of Dominica over a ten-year period as Economist, Development Economist and Chief Technical Officer, Trade, Industry and Tourism. Henry Wallice Charles is a PhD candidate in Social Policy at the Sir Arthur Lewis Institute of Social and Economic Studies (SALISES), University of the West Indies (UWI) St Augustine and former Regional Director of the Commonwealth Youth Programme, Caribbean Centre. Dr Christine Clarke is a lecturer and researcher at the University of the West Indies in the Department of Economics. She has served as Director of Economic Planning and Research at the Planning Institute of Jamaica (PIOJ), and previously Economic Adviser to the Director General of the PIOJ and Project Development Specialist for Vision 2030 Jamaica. Professor Anthony Clayton is the Professor of Caribbean Sustainable Development at the University of the West Indies. He is also a Visiting Professor at the University of Surrey, the University of Edinburgh and the University of Technology. Heather Cover-Kus is a Research Officer in the Climate Finance and Small States Section in the Economic Policy Division of the Commonwealth. She has a background in economics and public administration and has experience working with governments at the local, national and international levels. Crystal Drakes is a currently a Research Associate at the University of the West Indies, Cave Hill Campus. She holds an MPhil in Economics and a BSc in Economics and Management from the University of the West Indies. Dr Terri-Ann Gilbert-Roberts has been engaged for more than 14 years in research and policy development relating to Caribbean integration and issues affecting children and young people. Her academic research and professional experience include positions as a CARICOM Youth Ambassador and CARICOM Commissioner for Youth Development. Stacia Howard is the Managing Director of Antilles Economics, where she leads business development, drives the development of the forecasting models, and develops and contributes to articles by the company. Wonderful Hope Khonje is an Acting Economic Adviser in the Climate Finance and Small States Section in the Economic Policy Division of the Commonwealth. Since 2009, Mr Khonje has worked and published in a number of areas related to the economic development of small states. Alicia Matheson is currently a Research Officer in the Climate Finance and Small States Section in the Economic Policy Division of the Commonwealth. She has a background in international development and international relations and her research interests lie in the social development areas of gender and education. Dr Winston Moore is presently a Senior Lecturer in Economics at the University of the West Indies, Cave Hill Campus. Prior to this, he held the position of Senior Economist at the Central Bank of Barbados. His recent research has examined the issues surrounding the green economy, private sector development, and the economic impact of climate change on tourism. Ryan R Peterson, PhD, is the General Manager at the Central Bank of Aruba, and visiting professor at the University of Aruba. He holds a PhD in Economics and Governance, and for more than two decades has worked across several continents and countries in the areas of (regional and national) innovation, sustainability and competitiveness. Layne Robinson is the Head of Programmes at the Commonwealth Secretariat’s Youth Division. He leads the division’s work in the areas of youth participation, youth work professionalisation and youth development programmes. Dr Tom Rogers, a mechanical engineer by training, is a lecturer at the University of the West Indies Cave Hill Campus in Barbados, where he teaches at the undergraduate and postgraduate levels on the subject of clean energy systems for small island states. This issue of Small States Digest provides a critical examination of debt challenges in small states.